Profession: Seeker of the Lost Ways, Anointed Blade of the Jeazred. Standing at 5'6 and weighing around 120 pounds, the lithe drow is covered head to foot in soft gray clothing, along with a cloak and a hood. It is hard to see his heritage from the depths of the hood. His face is heavily tattooed, wings and hazy images running from his eyes to his jaw line. His body is covered with the same designs, ever changing and smokey images burned onto the skin. Black gloves cover his hands and knee high leather boots cover his feet. He wears a black jerkin, a red hand stitched into the front. The hand is a dark red, black veins running through it, giving it a weathered and aged look. On his hips are two sheathes, red and black leather. Inside them are twin dirks, obsidian blades shot through with red veins. On his right hip there is a third container, fourty two inches in length. It contains a rapier that glows with a faint green light and it almost never drawn. His clothes and gear speak of functionality and purpose. Eyes that flicker from dark red to purple, purple to black and black to green peer out from the hood and seem never to rest, missing nothing. His hands constantly fidget and his feet seem never to falter. His voice reminds you of the rain falling among the trees, a quiet whisper carrying an edge. His arms almost always cross over his thin chest, hands never far from his hips. Around his neck there is a small silver chain holding an oddly dull black flute. It is about six inches long and tipped on both sides with a pale white ending, the mouthpiece curving up and the other end curving down. Raised bumbs run along the top. The flute is almost always tucked under his shirt, laying near his heart. Rarely, he can be seen in his favored form, that of a fully mature shadow dragon. He is around three hundred and ninety two feet from snout to tail and his wing span is just short of double that length, still growing. When he chooses to stand, his head rises to roughly eighty feet over the ground. His race is one built along the lines of length, rather then height, bodies accustomed to weaving in and out of caverns and mountains. One eye is dark red, the other is black. Recent scars have turned his wings into a veritable spider web of thin lines. His tail is forked at the end, turning into three, spear like points forcing themselves out of the fin that can be seen there. His scales are as black as night, his wings are a shade of grey. Smoke can be seen billowing from his nostrils and mouth as well as swirling around his wings and feet. Mismatched eyes generally offer a simmering stare for the world, a cross between resentufl and blatantly hateful. When he is in this form, he is standoffish and arrogant, hateful and nervous. "Arrow of war, Forgotten Grove"
Skills: Dual Weapon Prowess, Sleight of hand, Drow Race Abilities and the gifts and tricks common to Dragons. At night, he will almost always be in dragon form, unless prompted to return to drow. During the day he will almsot always be in drow form, although that can and does change. 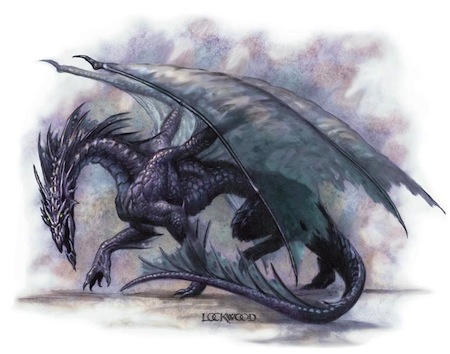 The drow can shift into his second form at will, that of a mature shadow dragon. He speaks the tongue in either form and can use his breath weapon in either form as well. Shadow dragons are considered evil by nature, and this one is almost an exception. Oppurtunistic, yes. Morals, no. Given his breed, his breath is a burst of smoke and shadows that exert massive mind control on a weaker foe and confuse and disorient the stronger types. Based on his affiliations, he is also capable of spitting a stream of acid.